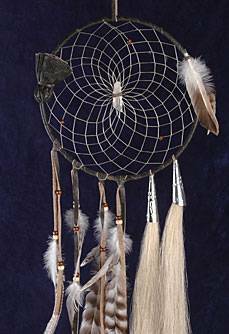 The Power of Dreams Dream Catcher- Detailed with distressed leather, duck pointer, hackle and imitation eagle feathers, wood beads, silver cones, horsehair and a quartz crystal. A pouch is tied to the side with a stone in it. Webbed with sinew. We can learn many things about our journey through our dreams. The crystal symbolizes the communication process as our dreams offer guidance. The pouch represents the medicine that our dreams provide in our healing process. The eagle feathers (imitation) symbolize the ultimate protection of our Great One.